Since its inception in 2002, the American Tort Reform Foundation’s Judicial Hellholes® program has documented in annually published reports various abuses within the civil justice system, focusing primarily on jurisdictions where courts are radically out of balance. Traditionally, Judicial Hellholes have been considered places where judges systematically apply laws and court procedures in an unfair and unbalanced manner, generally against defendants in civil lawsuits. More recently, the lawsuit industry has begun aggressively lobbying for legislative and regulatory expansions of liability, as well, so Judicial Hellholes reporting has evolved to include such law- and rule-making activity, much of which can affect the fairness of a state’s lawsuit climate as readily as judicial actions. In fact, as the nation’s economic troubles continued and state lawmakers and governors across the country sought to make their respective states more competitive and attractive to employers, 2011 proved to be a banner year for positive, liability-limiting tort reforms. Accordingly, this year’s Judicial Hellholes report offers much credit to such policymakers in an unusually sizeable “Points of Light” section. Turning back to the judicial branch, most judges do a diligent and fair job for modest pay. Even in Judicial Hellholes jurisdictions, including some that have received national attention, the clear majority of judges are fair, and the negative publicity can be blamed on a few bad apples. Because judges generally set the rules in personal injury lawsuits, and those rulings weigh so heavily on the outcomes of individual cases, it may only take one or two judges who stray from the law to sully the reputation of an entire jurisdiction. Though entire states may occasionally be cited as Hellholes, it is usually only specific counties or courts in a given state that warrant this citation. 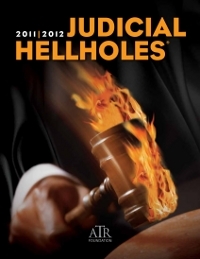 And, importantly, jurisdictions discussed in this report and online at www.judicialhellholes.org are not the only Judicial Hellholes in the United States; they are simply among the worst. This annual Judicial Hellholes report compiles the most significant court rulings and legislative actions over the course of the year as documented in real-time online. The report also reflects feedback gathered from American Tort Reform Association (ATRA) members and others with firsthand experience in these jurisdictions. Because the program has become widely known, ATRA also continually receives information provided by a variety of additional sources through its Judicial Hellholes website and other means. After interviewing such sources, Judicial Hellholes reporters work to confirm the information with independent research of publicly-available court documents, judicial branch statistics, press accounts, and various studies. To the extent possible, this report specifically explains how and why particular courts, laws or regulations can produce unfair civil justice outcomes in the jurisdictions cited. These cities, counties or judicial districts are frequently identified by ATRA members and other individuals familiar with the litigation. But because sources for Judicial Hellholes information may fear lawsuits or other retaliation in these jurisdictions, they sometimes prefer to have their names and cases kept out of the program’s reporting.